Third Eye Awakening: 4-in-1 Bundle is your one-stop definitive guide to awakening your third eye and learning how to open it. You have chakras all throughout your body that are tied to your health, energy, and soul. This audiobook will help you improve every part of your mind, body, and spirit. You will learn how a holistic approach to health and healing can change your life for the better. You will learn about lucid dreaming, mental clarity, and how to achieve mindfulness. Through various meditation exercises (some as short as five minutes, others approximately 20-30 minutes), you will learn how to activate your third eye with very simple techniques. Get your copy of Third Eye Awakening: 4-in-1 Bundle today! This audiobook will give you the opportunity to start your journey of spiritual awakening. With this book, you will learn the techniques and knowledge that helps you to activate your third eye chakra. This book has expounded much about the third eye chakra and its relation to the pineal gland. Simple and easy to follow techniques along with simple meditation exercises that can be used to activate the third eye have also been provided by the author; Chloe Brisbane also provided ways and information to assist you in decalcifying your pineal gland. Overall, I'm very much impressed with this book and I would definitely recommend this to my relatives and friends. The audiobook cleared up many things I was not sure about before. It is well researched, the author clearly has an excellent apprehension of the subject. I'm looking forward to learn more and get more information herein, and in just listening to this audiobook I was fully engaged with Third eye awakening. This audiobook will help you with all the things you need to know and you need to do in order for you to activate and awaken your third eye chakra. This book was really worth it. 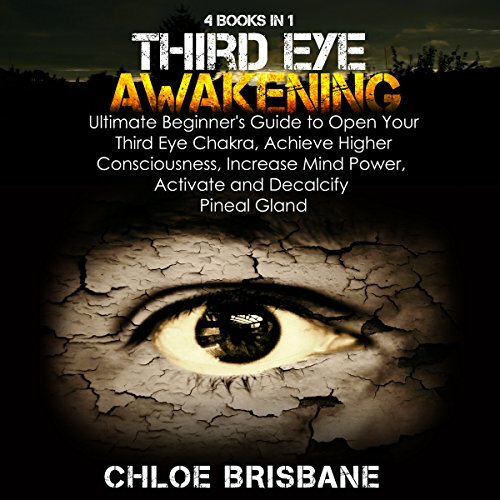 It has ideas that people wouldn’t normally know about the third eye and surprisingly it is a book bundle so I must say it is an indeed complete package audiobook that will help you to start your journey! Really great value for the price. great investment. these subjects are not new for me, but I found that this was helpful in learning new information and techniques, and also great for the beginners. I do believe this is the most useful audiobook I've invested and I'm lucky that I came upon this book! This book has helped bring clarity on a number of aspects of the third eye and given me insight on my experiences. I enjoyed this book and enjoy learning about this topic. It can get repetitive, though I found this helped my mind make strong associations as I moved along. I recommend it. The author nailed everything he wrote in this audiobook and I felt that it came from her heart. I salute her and I am so thankful for having this piece. This audiobook provides the information to someone who's looking for a great guide to help them open and awaken their third eye chakra. This is such an interesting yet powerful book indeed! Good job to the author! The narrators voice gives me goosebumps and really soothing to ears and of course the books are great. I have learned a lot!!! The audiobook gave me a lot of helpful information which gives both scientific and spiritual information about the third eye and the associated pineal and pituitary glands. This audiobook gives various techniques to open the third eye Chakra as well as to activate and decalcify Pinel Gland. If you're like me who's into opening your third eye chakra, then I don recommend this book to you. This provides the information into beginning with and understanding what third eye is and what will it offer with you until you've finally want to activate and open it; also you'll learn on how to decalcify Pineal Gland in this book! It helped me to master my own mind.. This is a book bundle wherein you can find information that will give you broader knowledge about what third eye is, how it works, where and when to get started, what it can give or offer to you and on how to activate an to pen your third eye chakra. The techniques explained inside helped me to master my own mind and raised my consciousness and awareness. This book is really a must for beginners and also to an experienced individual!